The opening ceremony was attended by President Vladimir Putin, Russian Prime Minister Dmitry Medvedev, Moscow Mayor Sergey Sobyanin, and Patriarch Kirill of Moscow and All Rus’. A total of about 300 events will be held in the concert hall in 2019/2020. They include music concerts, lectures, and meetings with entertainers. The program will also include workshops and interactive programs that incorporate light, sound, and 3D technologies. “This hall is meant to be the heart and soul of this unique park in the center of our capital, and to amplify the unique image of Moscow and all of Russia,” Vladimir Putin said. He also pointed out that the new concert hall was built with the most advanced technologies and is a musical complex of the future in every sense of the word. The concert hall, which totals 25,600 square meters in area, has 4 above-ground and 2 underground floors. Guests can enter the hall from Kitai-Gorod, or from the park. There are 2 halls here and 2 open amphitheatres, which will show concerts and plays that are happening on the main stage. The main facade of the building, which faces the square in front of the hall, is made out of glass. The other facade, which is made out of natural stone, features a built-in media screen in the shape of a trapezoid. The roof resembles a glass piece of bark, and the building itself is hidden by an artificial hill – a landscape element. It was built by Russian designers and construction experts in accordance with a concept developed by British engineers. The concert hall is a unique building because it features a lot of unusual equipment. There are special mechanisms that can turn the pit into a stage floor and change the shape of the stage. There are also options to change the number of audience seats and the orchestra pit area. These transformations create the opportunity to stage different kinds of performances in the venue. Because of the way the building is constructed, trucks with special equipment can be unloaded directly on its territory. The stage and the auditorium are equipped with stage lighting, remote spotlights with mobile, point and decorative hoists, platforms for the orchestra and chorus that can be lifted or lowered, as well as sound reinforcement systems for electroacoustics, video projection, technological video surveillance, and announcements. Additionally, there is a recording studio in the room. The concert hall has natural acoustics. To make the sound here perfect, specialists used more than 15 thousand unique acoustic panels weighing 150-600 kilograms. In Russia, these technologies were used for the first time. During the finishing process, the room was set to maintain a temperature of 21 degrees, along with a 45 percent humidity level. Nagata Acoustics America Inc. under the direction of Yasuhisa Toyota conducted acoustics tests for the halls. Mr. Yasuhisa Toyota also designed the the Walt Disney Concert Hall in Los Angeles and the Richard Fisher Arts Center in New York. The floor covering of the stage, made out of special stone cedar, ensures high-quality sound and the right amount of reverberation. The floor in the hall is a parquet made out of oak. The lobby features panoramic glass facades and decorative wood panels on the walls. The floor is covered with natural granite, and the ceiling is covered with panels made out of artificial stone. Top quality music instruments will be used during concerts, including an organ from the French company Mühleisen. It was assembled by hand in accordance with traditional technologies. The Moscow Zaryadye concert hall will not only host concerts and plays, but will also be used for briefings and press conferences. The location of the building, along with the architectural, technological and organizational capabilities of the hall put it in the same league with the best concert venues in the world. For City Day, a special “dancing” traffic light was installed in Moscow. It appeared at the pedestrian crossing on Tsevtnoy Boulevard, right next to the Nikulin Circus. The red light, which usually features a standing person, dances instead of standing still. There is a special cabin next to the light. Pedestrians can enter it and start moving around, and their movements will be scanned by a special camera. The dance of the person in the cabin is transmitted live on the red light. People can dance in the cabin while the red light is on for pedestrians. If there is nobody in the cabin, the traffic light works like a regular traffic light, featuring either a walking or a standing person. 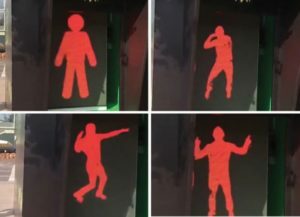 The traffic light meets all safety requirements: a dancing person is only broadcast during a red traffic signal for pedestrians. “For City Day, we decided to put pedestrians in the holiday spirit. To make waiting for the green light less boring, we installed a dancing red light. Plus, the new traffic light will put the city’s residents in a better mood. For example, if they’re coming home from a long day at work, they’ll smile when they see a dancing person on the red light,” said Vadim Yuryev, head of the Traffic Management Center. According to him, the location for the unusual traffic light is no accident: a lot of children visit the Nikulin Circus, and they’ll be particularly happy to see a dancing light regulating traffic. A similar light has already been tested in Europe. The city has also started testing a talking traffic light. When the light is green, a loudspeaker is turned on in the traffic light. It announces that pedestrians can cross, and also announced how many seconds they have until the light turns red again. When the light turns red, the traffic light announces this as well. 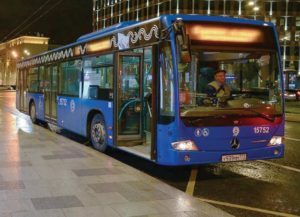 A new bus route that runs from the interchange hub at the Kitay-Gorod metro station to Vnukovo airport through the Lubyanka, Manezhnaya and Borovitsky squares, then along Bolshaya Yakimanka, Leninsky Prospekt and Borovskoye shosse has been established. The bus will run from Vnukovo Airport to the center from 11:30 pm to 4:30 am, and from the center to the airport from 1:00 am to 6:00 am. Buses will come every 30 minutes, and the route will take 1 hour 22 minutes each way. At the final stop in Kitay-Gorod, passengers will be able to transfer to most other night routes in Moscow: H1, H2, H3, H4, H5, H6, H7 and M10. During the day, Vnukovo International Airport is connected to the nearest metro stations by the city bus routes No. 911 and 611. Now, airport passengers will be able to use public transport at night as well. The city landscape park in South Butovo stretches over 142.5 hectares and is 7 kilometers long. In terms of total area, it’s similar to the largest green spaces in Moscow: Gorky park and Sokolniki. 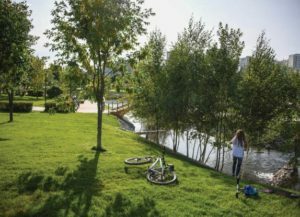 “When I came here, I wanted to make a good, quality park, because there was a huge district here and a lot of green space far from the center of Moscow and the city parks. I really wanted a quality, big city park here. I hope we were able to achieve this goal,” Mayor of Moscow Sergey Sobyanin said during the opening ceremony for the park. The highlight of the park is its water areas: the Chernyovskiye and Gavrikovskiye ponds. The Koryushka River (also called Chernyanka) also flows through the park. The total water surface area amounts to 19.5 hectares, not counting streams and channels. The improvement project, which was approved by the Moscow government in 2017, enabled the establishment of a major city park with quality infrastructure. It’s a good place of leisure for the residents of South Butovo – one of the largest districts in Moscow, with a population of 200,000 people. There are 4 summer stages in the park: a green theatre for 300 people, a summer theatre for 100 people, and amphitheatre for 170 people, and a dance floor. They will be used to hold concerts, dances in the evenings, and other events. The park’s guests can rest in 10 covered gazebos (“Shamrock,” a chess house, five tea houses, two summer libraries, and a cafe). Numerous pergolas – green canopies – will be the park’s main attraction. One of them has a swing installed underneath. The establishment of numerous children’s and athletic spaces was an important part of the project. There are also 2 picnic areas with 15 seats each, paths for walking, wooden decking, benches, urns, bathrooms, navigation racks, lighting supports and video surveillance cameras. There are more than 12 kilometers of bicycle paths for fans of cycling. The story of the French jewelry boutique dates back to the beginning of the 19th century. Since 1827, the jewelry makers of this family business have embodied their passion for precious stones in gorgeous jewelry. The brand’s clients include members of royal families and golden era Hollywood divas Greta Garbo and Marlene Dietrich. Photographs of the latter are still kept in the Paris salon. They show Dietrich stretching out her hand to show off the emerald bracelet around her wrist. Today, Mauboussin is a combination of the heritage left by the French jewelers and a modern approach. The creations with semiprecious stones and recognizable collections featuring the famous jeweler’s symbol (a star) have made the brand especially popular. People can now look at, try on, and purchase signature jewelry in two locations in Moscow, because the brand recently opened another boutique in Afimall shopping center. The first boutique opened its doors at the end of 2017 in the very center of the capital, on Nikolskaya Street. 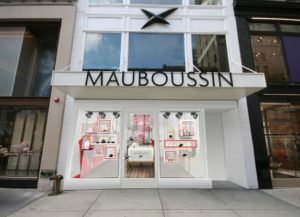 Aside from jewelry, both boutiques also offer Mauboussin fragrances. Beauty addicts from all over Russia have been waiting for this for a long time – Sephora has finally opened its doors in the Aviapark shopping center. The store houses over 10 international cult brands, including the unforgettable Kat Von D Beauty, the high-fashion Marc Jacobs Beauty, the natural Becca, the bright and magnetic Huda Beauty, and many others. Trendy publications write about them, and bloggers and celebrities recommend them. The store has both new beauty brands that can only be found here, and famous brands that are already popular all over the world. There is skincare, fashionable fragrances, hair products, and bright and expressive makeup. Since Sephora’s founding in 1969, the company has been establishing new trends with their unusual approach to the beauty industry – turning shopping into a pleasurable pastime. Sephora is part of LVMH (Moet Hennessy Louis Vuitton Group) and is the leading international beauty retailer. 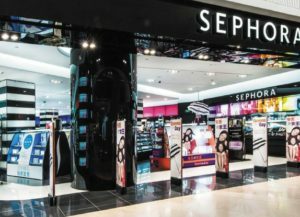 In 2018, Sephora was the recipient of the “Retailer of the Year” award at the World Retail Congress. 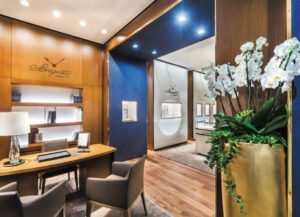 Two floors of a new Breguet store with a total area of 317 square meters have opened on the 1st line of the GUM. Decorated in an exquisite style with the help of ultra-modern materials, the space is an elegant fit for a luxury watch store and the historical architecture of the GUM. The two floors, which are jointed together with a marble staircase, complement each other perfectly. The first floor is the boutique’s showroom, which features the Breguet collection, as well as jewelry made by the watchmaker’s specialists. The second floor houses an official center, reception rooms with a view of the Kremlin, and the first Breguet museum in Russia with a rotating exhibition. Russia and Breguet are linked together with a long history that includes a lot of famous people and members of the Russian elite. Prominent Russian figures have owned Breguet watches throughout the years: Alexander I of Russia, poet Alexander Pushkin, and composer Sergei Rachmaninov, for example. Some of their watches are on display among Breguet’s exhibits in the GUM museum. There is Prince Sergei Golitsyn’s traveling watch, a small table clock made out of four parts that belonged to Prince Shcherbatov, the watch sold to Anatoly Demidov, and many others. Visitors can also master the art of applying complex guilloche patterns in the Breguet boutique, because the store has an old hand-made guilloche machine that was made in 1910. It was brought to the GUM directly from Vallée de Joux, which is where Breguet’s headquarters are located. SYROVARNYA ON USACHYOVSKIY MARKET. All over the world, food markets turn into locations for food lovers to get together and are attracting more and more food connoisseurs. Buying food, dropping into a restaurant, checking out new trends, attending workshops, meeting chefs and farmers – people can do all of this in one place. You can come to the market with kids or your whole family, go on a date, or meet up with friends and colleagues. The new Syrovarnya at Usachyovskiy Market has famous homemade cheese from the shop located right in the market, uncomplicated village-style dishes, and a familiar interior. Most of the menu is comprised of the chain’s biggest hits, which people book tables a week in advance to try and are willing to wait in long lines for on the weekends: stracciatella with arugula and tomatoes, salmon with potatoes, and magnificent pies with fresh blueberries. And of course, there are different types of cheese on offer: ricotta, burrata, mozzarella, scamorza, and others. The restaurant is separated into a main hall and a spacious summer veranda that feels like it’s floating above the street. Like in other restaurants by the same chain, the Syrovarnya at Usachyovskiy Market has a shop where you can take cheese, sweets, and other products after dinner or just on your way from one farm shop to another. HAPPY END BAR & KITCHEN. This is currently the most trendy place in town and is definitely worth a visit. 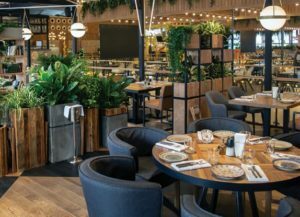 The new place from the owners of Pachamama Group in London and Bek Narzi opened its doors at the Patriarch’s Ponds, on Spiridonyevskiy Pereulok 9. According to the owners, it’s not a restaurant in the literal sense of the word. The food here is good, but there is also a pleasant bonus. When putting the menu together, the restaurant stressed Peruvian cuisine, as well as Asian, Brazilian and London dishes. 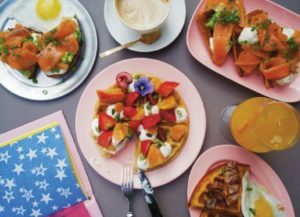 Happy End is open for brunch from 12.00 pm to 4.00 pm on the weekends. The interior is relevant and new, done in the style of a New York millennial apartment. The cocktail menu has a lot of charming twists on 90s classics, and is one of the best cocktail menus in the city. More complicated drinks are mixed in the upper bar, in a yellow Japanese style room for 13 people. There is no menu, but there are bartenders who are good at figuring out what each guest would want to drink. PANDA EXPRESS. The largest Chinese cuisine chain Panda Express is finally on the Russian market: the brand’s first restaurant opened its doors in the Mega Khimki Shopping Center in Moscow. The company Panda Express Russia was registered at the end of 2017 and is now part of Shokoladnitsa Group. The very first Panda Express opened in the US in 1973, and was founded by Asian immigrants Andrew and Peggy Cherng. The chain now has over 2,000 locations all over the world and and is the largest Chinese fast food chain in the fast casual segment. Negotiations with the Cherng family were held for 5 years before the restaurant could open in Russia. 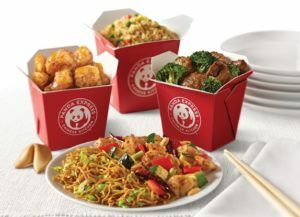 The menu features the famous orange chicken, beef & broccoli, Kung Pao chicken, noodles, and a WokSmart healthy food menu with dishes that don’t exceed 300 calories. K-GRILL. 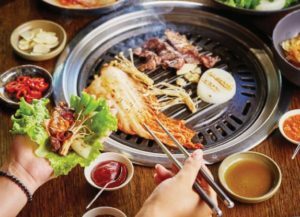 A new Korean restaurant on Sadovaya-Chernogryazkaya Ulitsya 10/25, K-Grill focuses on bulgogi, or Korean barbeque. Every guest can make it themselves, which is why there are grills installed at every table. The restaurant’s chef combined the traditions of North and South Korea: sour dressings, sweet sauces, pickled snacks. All of the flavors come together perfectly, and the spicy sauces are mild enough for a European palate. Here, cooking is a kind of ritual – it can be done independently or entrusted to the waiter. Guests have different types of meat to choose from: marble tenderloin, pork brisket, beef ribs, pickled ribeye. There are several types of sauces and ingredients – nori, kimchi, vegetables, and mushrooms. The bar focuses on cocktails based on Korean alcohol: rice ale and soya. Ginger, cinnamon, turmeric and other spices add flavor and tartness to the beverages. The non-alcoholic drinks are heavy on the spices as well: the ginger lemonade has curry, and turmeric is added to the grapefruit iced tea. Guests can see their dishes being prepared in the kitchen through a huge window in the restaurant. VERTEL. The “Gastromarket” on Maroseyka 4/2, bldg. 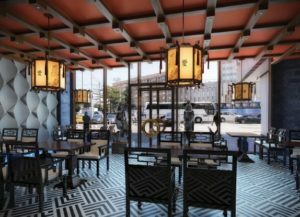 1 now has the first Vertel Israeli cuisine corner in Moscow. The foundation of the restaurant’s dishes is marble beef cooked on a real Lebanese skewer that is about 100 years old. The menu features over a dozen Middle Eastern dishes, from shawarma in pita and hummus with falafel to saj with lamb meat. On some days, you can bargain here like in a real Israeli bazaar. 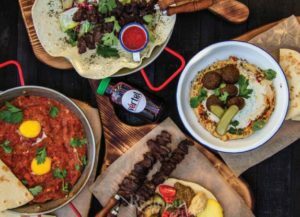 The goal of the project is to introduce visitors to high-quality Middle Eastern street food. The spices are shipped from Israel and Turkey, and 50% of the dishes are vegetarian. The lavash and pita for hummus are freshly-baked right before before serving. CHINA BLUE. A Chinese restaurant from the owners of Darbars and Tokyo has opened its doors in the Azimut Hotel on Smolenskaya 8. The menu features traditional Chinese dishes: spring rolls, spicy cucumbers, dimsum, wasabi shrimp, rice, noodles, and crispy eggplant. The restaurant’s interior is done in darker colors: the ceiling is painted red, and the floor is lit up with a bright blue light. It’s a great atmosphere, and the prices are fair as well. The average check is about a thousand rubles, which is a big plus for a restaurant in the center.